Yesterday my two cousins, J and M, came over. We were babysitting while their parents were at a Christmas party. Every time they come over we do a different craft and they love it. On time it was painting, another time I taught them how to hand knit, and this time we made Christmas trees. Yarn wrapped foam cones, with pompoms, trim and ribbon. I got everything out before they came over and put it all out so they would have multiple things to choose from. I looked through our supplies at home and had much of what we needed, like the ribbon, pompoms, trim, and Christmas fabric. I only had to buy the foam cones and the green frilly yarn. (Later I saw that we could have made our own cones with paper plates, good to know for next time. 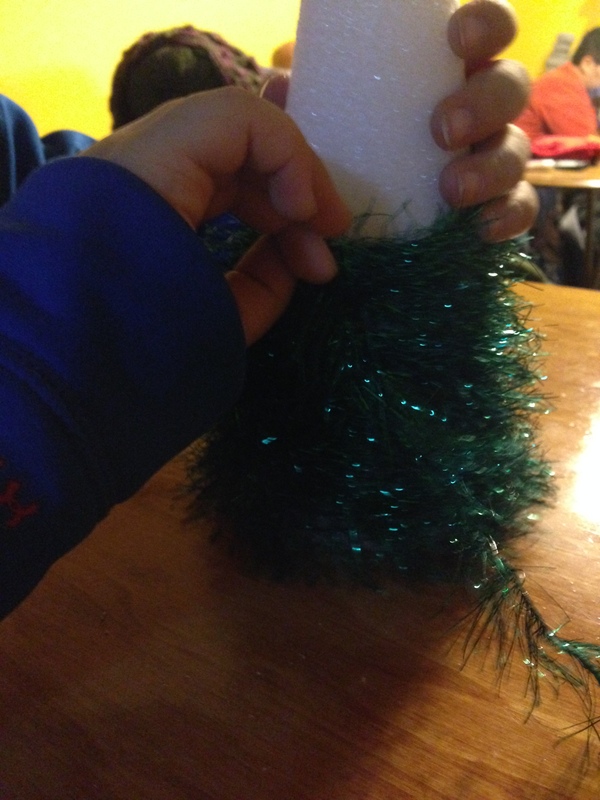 The first thing I did was have them wrap the trees with the yarn, I used a hot glue gun for the base and the top. I think this part took the longest for M, he was very technical about it. While he was working J had to wait, we were taking turns, and M says, “Patience, my young padawan.” Love a good Star Wars reference and my brother cracked up laughing. 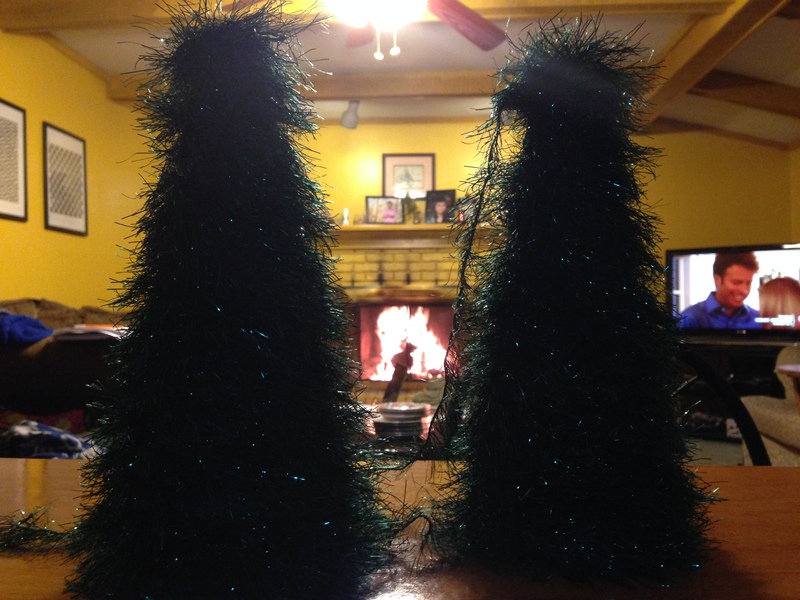 Their wrapped Christmas trees with a roaring fire place in the background and a Christmas movie on TV. After this was done we took a break because dinner was ready. I had a lot of things for them to chose from, red and gold ribbon, snowflakes, pompoms, trim that had snowmen, gingerbread men and lights. I let them pick whatever they wanted and the things I had less of we split equally, to be fair. 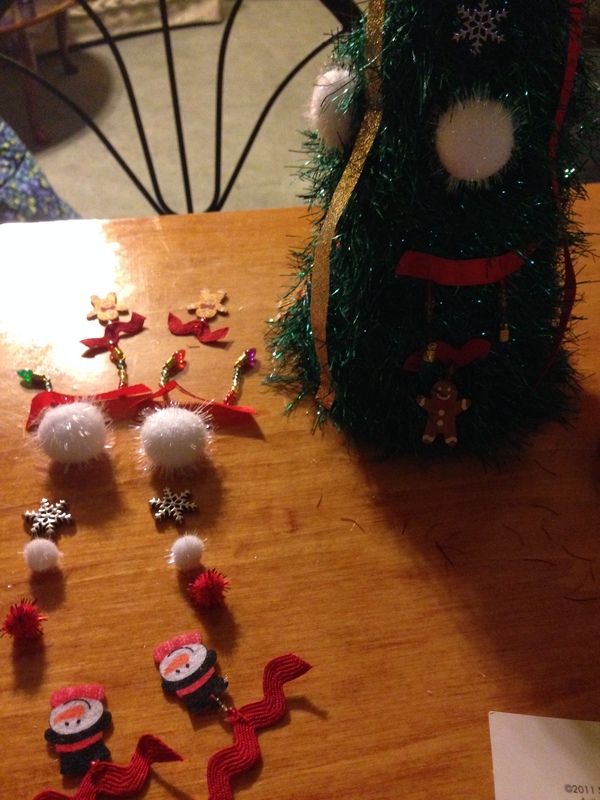 J made four equally parts on his tree and laid it all out in a pattern so they would all be the same. M was a more free flowing and wanted this here and that there. Since I used a hot glue gun I was in charge of it and put dabs of glue and had them hold things in place for 10 sec, 30 sec, or a minute depending on how big the item was and it allowed me to go back and forth between them. Later my brother took them to see Big Hero 6, so while they were gone my mom and I made tree skirts out of fabric. We just cut out circles and glued the edges down so it would look finished. When they got back we finished them up and the tree skirts and little presents. 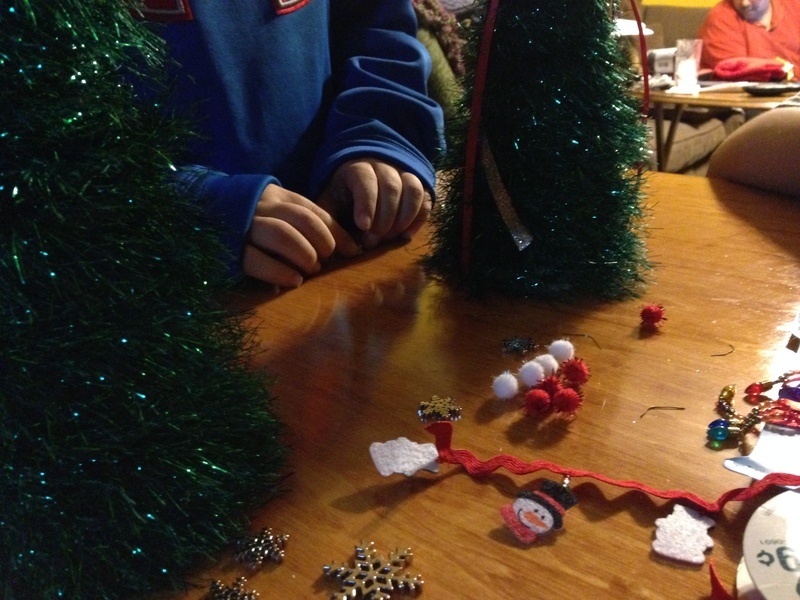 This project was a big hit with them so I’m glad we did it and their mom said she was going to use them as the centerpieces for our extended family Christmas dinner. What we used on our trees. I found this idea on Pinterest but I can’t find the pin so I don’t know the original poster. If anyone knows please let me know i n the comments. Thanks. This is a fun craft project to do with kids. 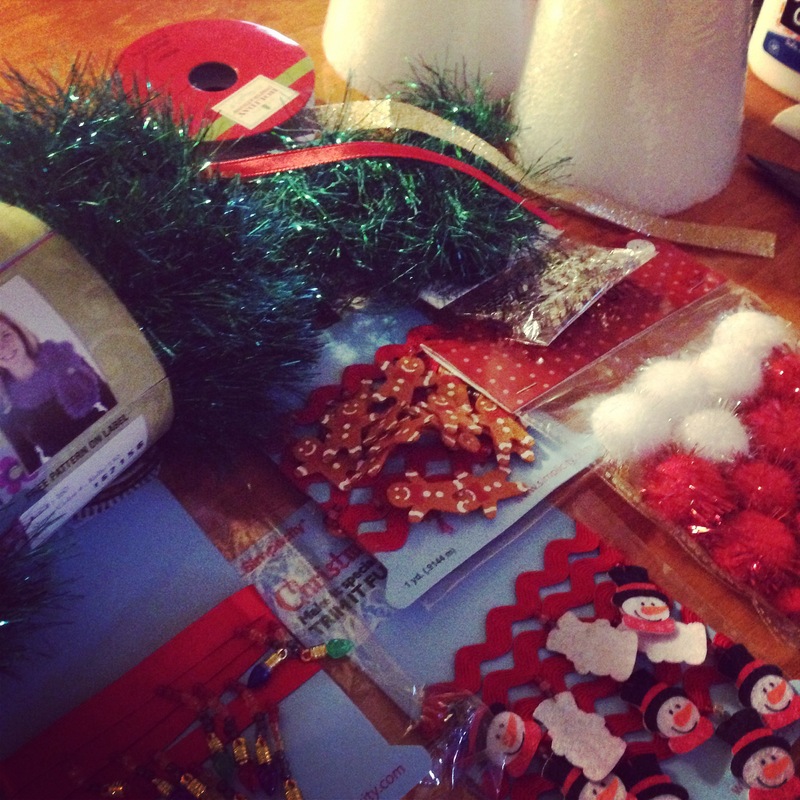 Have you done any Christmas crafting?